You would like to prepare a merged PDF bundle containing multiple PDF documents. Here’s a tip on how to improve your process: make the combined PDF easier to navigate by adding a table of contents, auto-generated based on the files that you are combining. Drag all files to the web page. Click More options and the select the option to generate a Table of contents based on the filenames. Alternatively, you can also try using document titles. 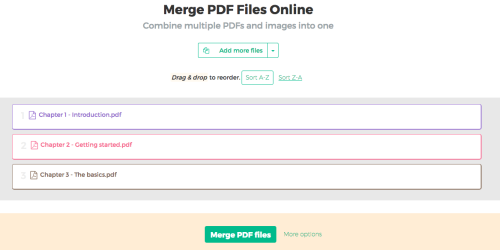 Click the Merge PDF files button and then when the task completes click Download to save your merged file to your local computer. Nowadays offices moved completely in the cloud and Chromebooks are becoming popular. The Sejda PDF online services integrate with Google Drive and Dropbox so you can process files from your Cloud storage and save them back when done. There are scenarios where uploading sensitive files to a third party service is not allowed. Files cannot leave the corporate network and a desktop application that processes the files locally is requred. Sejda PDF offers a desktop application that has the same features as the online services but the files are processed locally, not in the cloud. Sejda Desktop is free to download and use with daily limits. Power users that reach these free limits are asked to upgrade. The use case: I have 20 filled out forms with the same structure but different data sets. I’d like to archive them by merging them all into one document. Most PDF merge programs will not handle properly having multiple form fields with the same name in the same file. Sejda’s PDF Combine tool handles this nicely by default, without extra configuration needed. More you can even opt to flatten out the form fields, meaning the value will be displayed but the form field will not be editable anymore. Even better if you’re archiving the form and want to preserve the current filled out values. When you’re merging a 3 pages document with a 6 pages document you get a merged PDF document that can’t be nicely printed double sided, since the first page of the second file will now be on the back of a page belonging to the first merged file. 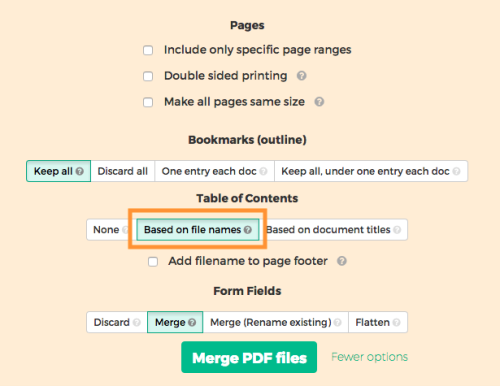 Sejda’s Merge PDF has the option to prevent this, by adding a blank page if the document being merged has an odd number of pages. The use case: you have a PDF document but you’re only interested in part of the content on the page. Sometimes you want to print and avoid the outrageously large borders. Other times you want to extract some data to an Excel file and need to crop out the data table first so the table detection works better. Or you just want to trim the PDF document pages. Here’s how to crop a PDF document using Sejda’s toolset. Drag and drop the PDF file to the webpage. Or click Upload PDF files and select a local file. Or pick a file from Google Drive or Dropbox. Alternatively you can define the margins by typing in the inch values. The really great part about Sejda’s Crop tool is that all pages are rendered one over the other in a blended mode so you can easily figure out what is a crop box that works for all pages and doesn’t cut out content from say 5th page. Input directly the values in inch, if you know them. Or make a crop box selection manually using the mouse. 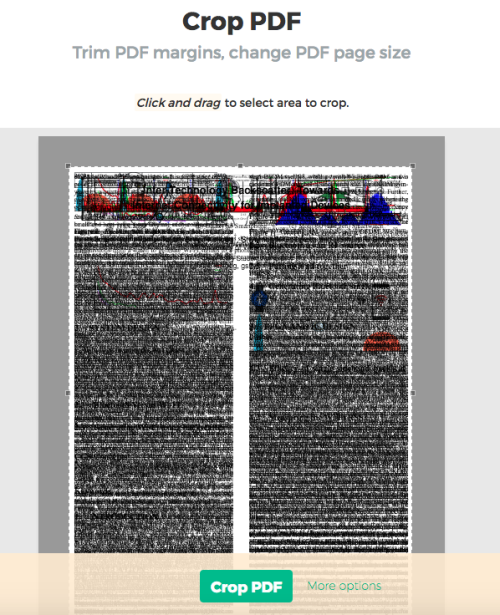 PDF cropping does not get any simpler than this. The easiest way to do this is to simply hit Ctrl+P in your Google Chrome or Mozilla Firefox browser and then choose Save as PDF (instead of printing to paper). But if you’re looking to convert multiple pages that becomes easily cumbersome. 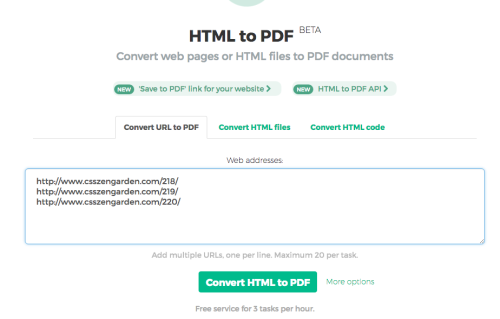 Sejda’s HTML to PDF helps with easy batch conversion of multiple URLs to PDF documents. Wait for the task to complete, then Download a zip containing all PDF documents. You have a program that outputs HTML reports, and you’d like these files as PDF. Sometimes these files are quite large, up to 50Mb. Sejda’s HTML file to PDF converter helps with this use-case as well. Alternatively you can simply copy and paste the HTML code on the Convert HTML code tab. Sejda’s HTML to PDF conversion is very accurate, just like a browser. What you see in your browser is what you get in your PDF document. An HTML to PDF api is available to integrate the conversion in your programs. No setup is required. The web page URL to be converted is determined from the HTTP Referrer. Want to configure the URL of the page being converted? Want a specific page size? © 2017–2019 Copyright by PDF merge online. Moth theme by Theme Grinders.